How things have changed since the 1986 premiere of Hugh Whitemore’s play based on the life of Alan Turing, pioneering mathematician, war-time codebreaker and post-war digital genius. Then, being gay was linked with the HIV scare and the perniciousness of Clause 28 was about to pollute minds. Today, Turing is a national hero receiving a posthumous royal pardon for his 1952 conviction for “gross indecency” with another man, and we inhabit a world of gender fluidity, with the digital algorithms Turing once imagined now shaping everyday reality. But this emotionally powerful Royal Exchange revival seems as timely as it was thirty years ago, conveying the play’s delicate balance between the biographical detail of a man who could shatter secret cyphers but was himself deconstructed by the moral codes of 1950s Britain, and digging deeper into issues of maintaining national loyalty while remaining true to one’s self. Framed – possibly even entrapped – within a cube of LED strip lights, Robert Hastie’s edgy but simply staged in-the-round production neatly squares the tragic circle of Turing’s life, moving fluidly between timelines. 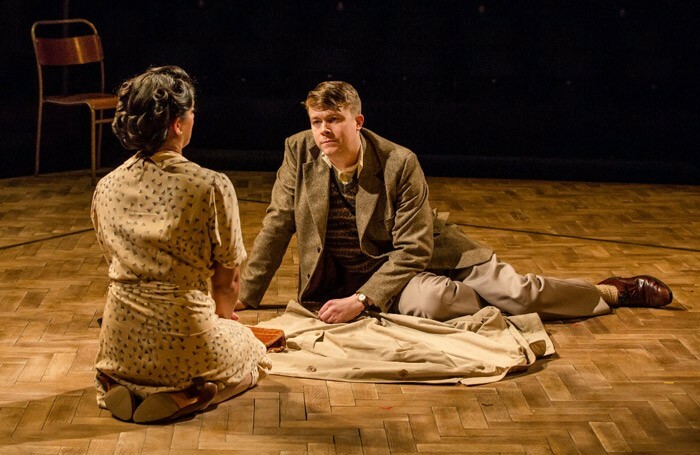 But the production ultimately belongs to Daniel Rigby who, after a hesitant start, soon begins to embody Turing’s complicated mix of conceptual brilliance and awkward social charm. A strong cast includes Geraldine Alexander as the ultimately supportive mother, Natalie Drew as the maths genius whose passion for Turing can never add up, Harry Egan as the rough lad who is the catalyst for his downfall and Dimitri Gripari – making his professional debut – as the Greek god-like youth who finally brings out the inner Turing.